Baidu App Store seems to no longer work. It can check for outdated programs and lets you browse through other apps within its store, but every attempt to download software results in a constant loading screen. There are lots of alternative free software updaters you can use in place of this one. Baidu App Store is a free software updater that automatically scans your computer for outdated software and then notifies you of what programs need updating, among some other awesome features. Because Baidu App Store is an entire suite, it also includes things like a free store where you can download software and games, as well as an uninstaller tool that removes programs you no longer want. This review is of Baidu App Store version 5.0.1.8682. Please let us know if there's a newer version you'd like reviewed. Runs on Windows 10, Windows 8, Windows 7, Windows Vista, and Windows XP. Updates are downloaded within the Baidu App Store program itself so you don't have to visit a website to download the update yourself. The size of the download, version number of the update, and date of the release are shown in Baidu App Store. 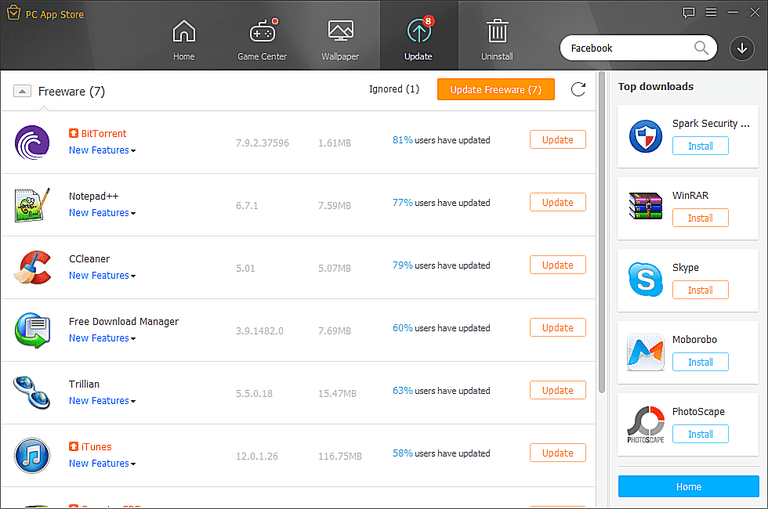 A changelog is shown for each program, which tells you what features are new in the updated version. The percentage of Baidu App Store users that have updated a particular program is shown alongside an update so you can quickly determine if you, too, might want to update. Also included in Baidu App Store is an automatic Desktop wallpaper changer, an entire app store of free applications and games, plus a program uninstaller. Baidu App Store is maintained by the same developers as the popular virus scanning program Baidu Antivirus. Baidu App Store works really great and is super easy to use. It's certainly one of the best software updater we've ever worked with. Even though the program has many extra features, we still think this should be in your top five picks when looking for such a tool. Because Baidu App Store supports bulk downloading, you can download all the updates at once with one click. You don't have to manually find the updates online and you don't even have to click "Update" next to each individual program that you want updated. All the setup files will open one after another once each program has been installed, which is really nice considering you can sometimes lose a download file once you've saved it to your computer. One downside is that Baidu App Store doesn't show the version number of the installed program. All it shows is the version number of the updated version of the software, but not the version you currently have installed. Sometimes it's helpful to see what version you're coming from before performing an update. Some other free program updaters do include the current version number in their list of outdated software and I'm sure Baidu App Store could as well with a future update of its own. We'll see.